LOL! Tuesday after work Keifer comes home and says he found a beagle puppy and it’s only in Georgia a little over a hour away. Want to go see them. Understand here that we just gave our golden retriever away last Saturday to a loving home simply because her big doggie frame was too much for our new home and tiny back yard. I had to coax the kids for several months about giving her away. Finally, they agreed and we found a wonderful couple who specifically wanted a golden and planned to treat her as “their baby.” Copper left on Saturday morning, and Tagger joined our family Tuesday night. 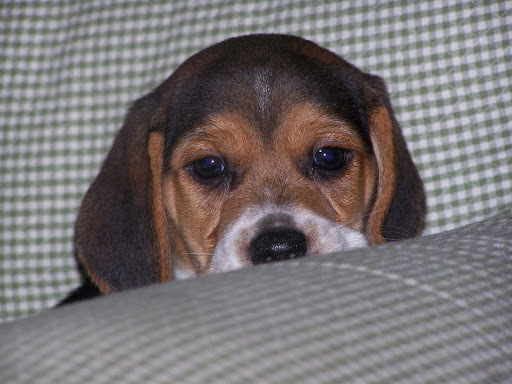 We love dogs and did a lot of research on beagles and found that they would fit best with our family and our lifestyle. We wanted a small dog that sheds minimally, great with kids, and had plenty of personality. Tag, as we’ve nicknamed him, has plenty of it all. Anyway, the kids love him and he’s seems to like us pretty well too. This entry was posted in Uncategorized on September 4, 2008 by aliciachall28.